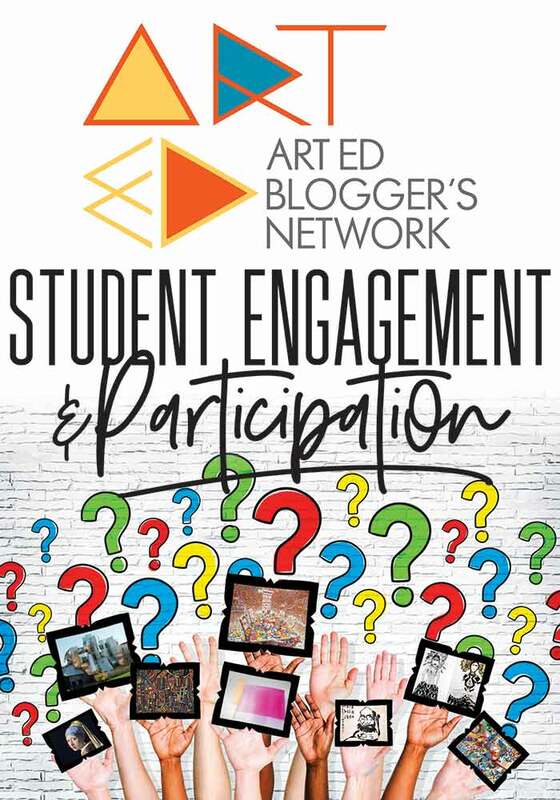 It is time for this month's Art Ed Blogger's Network post! This month's topic is Student Engagement and Participation. Here's the thing. I think students are engaged when you give them stuff to do that excites them, that they don't get to do every day, where they have significant personal input in their final product, and where they will be proud of their final product. 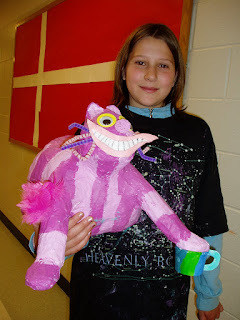 So often, I see former students, many years after they've graduated from high school, and then tell me they still have the papier-mache project they made in 3rd grade, or 5th grade, perhaps. That's when I feel like I've done something right! 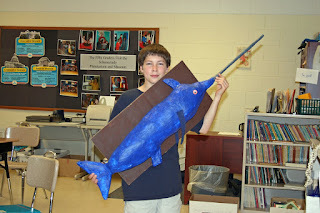 I think that's why I love papier-mache so much. It's not something kids do every day, and they are excited to create a structure that will be unlike anyone else's, and they are excited to dip their hands into slimy goo. Kids are engaged when they are busy, and when they are busy and engaged, they forget to misbehave, so it's a win-win situation. 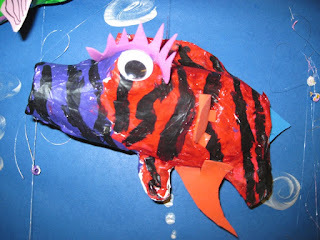 For people who are afraid to do papier-mache with their classes with the most behavior problems, I say to give it a try, because kids misbehave when they are bored, and nobody is bored when their hands are busy with papier-mache!!! Especially when they are given lots of personal choice. 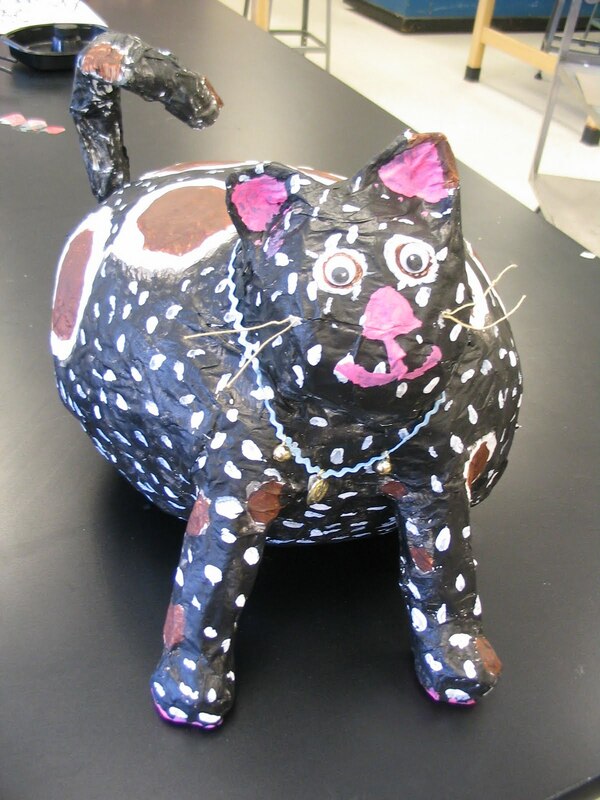 For example, for these 5th grade cats pictured above, the basic structures were all built the same way, but the particular way each cat was posed, and how they were painted and embellished, make them uniquely original. Same thing with these 3rd grade tikis above. The basic structure began with a tennis ball container, but then each became totally original as the features were added, and and embellishments were added. 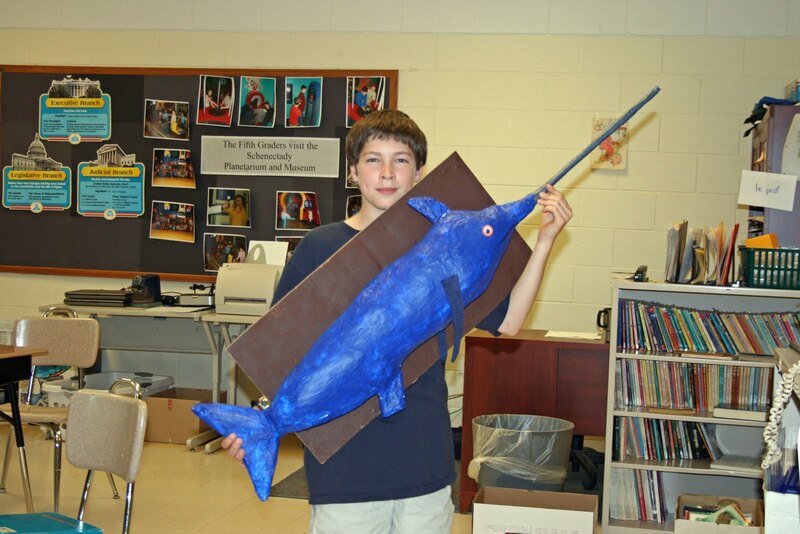 But papier-mache is not the only way to engage kids. Any time we do a project that involves rummaging through trays and boxes of 'stuff', I find the kids get very enthused. I find students especially love the opportunity to create collages that use a lot of random textural objects. Above, are two first grade pieces, based on the story of the Princess and the Pea. Can you find the pea hiding under each mattress? 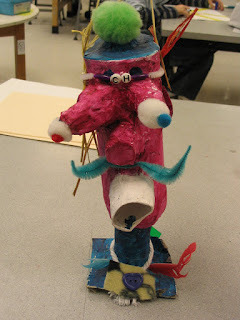 Below, and at the top of this post, 2nd graders created wild beasts using assorted collage materials. In the school where I taught, the 6th graders were sort of balanced precariously between elementary and middle school, but still came to elementary for art. They didn't want to feel like babies, and therefore could be harder to engage than the always-enthusiastic little kids. My method to keep them engaged was to give them tools and materials they didn't use when they were younger, and challenge them with long-term projects with basic parameters but also a lot of personal choice. 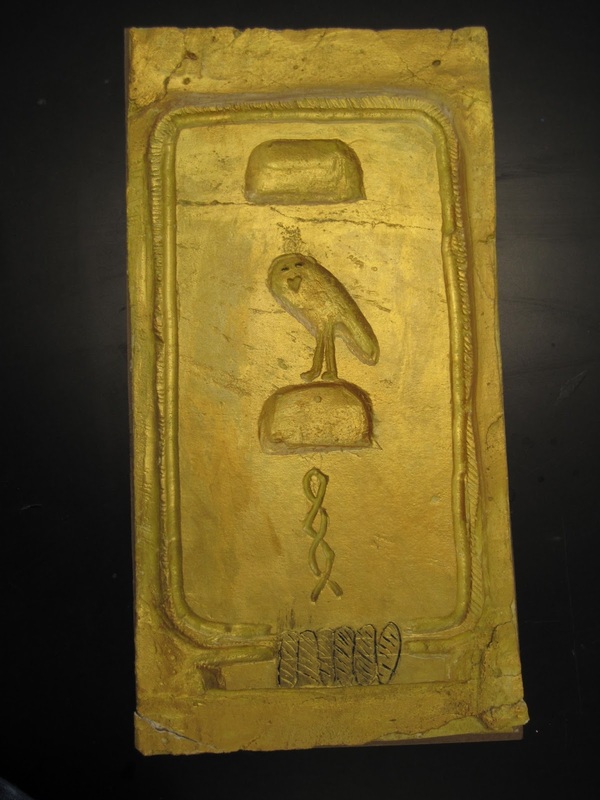 Here's some examples: First, a cartouche design carved out of Sheetrock. Next, two examples from 6th grade altered books. Below are two examples from a "people in motion" plaster bandage project. And below, a plate design based on the story of Blue Willow dishes. Rather than having students decorate paper plates, likely to be discarded after they were done, I bought a selection of white plates at yard sales and flea markets. It didn't cost much, and everyone was proud to take home their plates when they were complete! I've been talking about a lot of personal choice in student projects. Let me be clear, I am not a TAB (Teaching for Artistic Behavior) teacher, but I do believe that projects I do with my students will be more successful and meaningful if there is ample opportunity for personal choice within the parameters of the assignment. If this is scary for you, take baby steps. Maybe the choice will be to simply let students select the color paper they will use for a collage or painting surface. Or maybe the choice is to put different selections of paint at each table, and letting students choose which table to go to. When you set your parameters for a project, don't forget that your students will be more engaged, and therefore less inclined to disruptive behavior, if they have been allowed to make some decisions about their finally product and thus are more personally invested.